Everything that is done in the world is done by hope. No merchant or tradesman would set himself to work if he did not hope to reap benefit thereby. One is not righteous who does much, but the one who, without work, believes much in Christ. The law says, 'Do this,' and it is never done. Grace says, 'Believe in this,' and everything is already done. When God contemplates some great work, He begins it by the hand of some poor, weak, human creature, to whom He afterwards gives aid. I have lived to see the greatest plague on earth -- the condemning of God's word, a fearful thing, surpassing all other plagues in the world; for thereupon most surely follow all manner of punishments, eternal and corporal. A great variety of reading confuses and does not teach. It makes the student like a man who dwells everywhere and, therefore, nowhere in particular. It is certainly true that reason is the most important and the highest rank among all things and, in comparison with other things of this life, the best and something divine. It is the inventor and mentor of all the arts, medicines, laws, and of whatever wisdom, power, virtue, and glory men possess in this life. Religion is not 'doctrinal knowledge,' but wisdom born of personal experience. If you are a preacher of mercy, do not preach an imaginary but the true mercy. If the mercy is true, you must therefore bear the true, not an imaginary sin. God does not save those who are only imaginary sinners. Be a sinner, and let your sins be strong (sin boldly), but let your trust in Christ be stronger, and rejoice in Christ who is the victor over sin, death, and the world. We will commit sins while we are here, for this life is not a place where justice resides. We, however, says Peter (2. Peter 3:13) are looking forward to a new heaven and a new earth where justice will reign. All the cunning of the devil is exercised in trying to tear us away from the word. The bible is a remarkable fountain: the more one draws and drinks of it, the more it stimulates thirst. It is a good thing to let prayer be the first business of the morning and the last of the evening. There is no gown or garment that worse becomes a woman than when she will be wise. It would be a good thing if young people were wise and old people were strong, but God has arranged things better. Heavy thoughts bring on physical maladies; when the soul is oppressed so is the body. Some will object that the Law is divine and holy. Let it be divine and holy. The Law has no right to tell me that I must be justified by it. 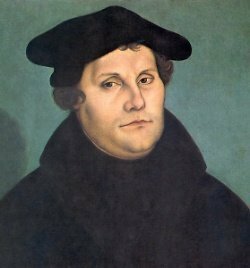 Bio: Martin Luther was a German professor of theology, composer, priest, former monk and a seminal figure in the Protestant Reformation. Luther came to reject several teachings and practices of the Late Medieval Catholic Church.